"As Autumn leaves fall and the foxes, wolves and bears hide among the trees, we tell you a magical story about family, love and the power of dreams. The first snow falls. Watching the village children play, a lonely couple yearn for a child of their own. They build a small figure from the ice and snow, and wish very, very hard... until the strength of their longing brings the magical snow child to life before their eyes! She's a girl like no other. As she dances in the wild landscape and talks with the animals, she brings joy, fun and laughter to the whole village. But it's not easy, bringing up a wild daughter of the blizzards and the wind. 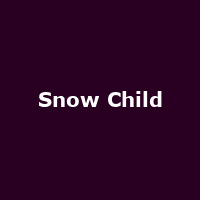 As the seasons turn, and winter gives way to spring and summer, will the Snow Child and her parents find their "happily ever after"?"